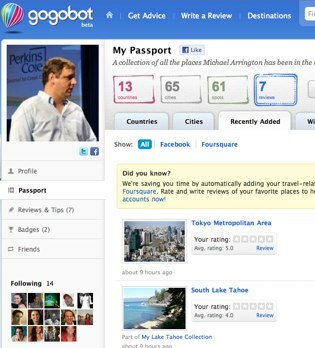 I like to think of Gogobot as a Yelp for travel, or a TripAdvisor that puts users first. If you travel a lot and want to write about the things you did, or if you want good tips on travel, it’s an excellent resource (see our launch post from last year for a detailed review). You can navigate Gogobot by searching for places or things. Or, you can see where a particular user has gone by navigating his or her “passports.” To date users have added 300,000 places they’ve visited and/or written reviews. Which is great. But Gogobot wants more data. Lots more. Today they unveil a simple feature – integration with Facebook and Foursquare so that, if you give your permission, all of your location check-ins are automatically added to Gogobot. They actually set up my account over the weekend to let me test the new feature, and you can see my various check-ins, ported over to Gogobot, here. Here’s the great thing about this. The places I’ve visited (including a lot of fantasy destinations via Foursquare). Now I can visit Gogobot when I have time and add in reviews of the hotels, restaurants and activities that I did while I was there. And since Gogobot already organizes things intelligently, a lot of the work is already done. For example, a fantasy trip to Dubai via an old fake Foursquare checkin is listed separately. But most of my various Silicon Valley check-ins in Palo Alto, Menlo Park, etc. are grouped under Silicon Valley, so my city page isn’t cluttered. Another reason to use Gogobot, and another way Gogobot will collect lots more data to build a nice network effect. I like this startup.